"People actually lost their mind. We got letters, and phone calls. Some people just stopped coming by our restaurant," said Marcella Smith, regional director of NYC's beloved comfort-food chainlet Parm. "Guests would actually get visibly mad when they were at their tables and yell at our servers. I almost expected full-blown protests in the street." The ire she's describing had nothing to do with border walls or the dark net. It revolved around mozzarella sticks: those glorious breaded and deep-fried tubes brimming with molten cheese. So what was the grave injustice? Parm temporarily removed the dish from the menu to retool the recipe. And it is exceptional. The place is an ode to the Italian deli from high-flying chefs Mario Carbone and Rich Torrisi, who run a number of high-end restaurants in NYC. The short menu of classics like chicken Parm and ziti is engineered with top-notch ingredients and cheffy techniques. They swiftly learned their lesson. Even if they were just OK, though, people might have still cried foul. Because people LOVE mozzarella sticks. If God was one us and made snacks like one of us, he would probably create the mozzarella stick. But where did it come from? How did it transition from obscurity to a beloved fixture of bowling alleys, Italian restaurants, and fast-food chains in just four decades? Did some little Italian grandpa whip it up in the back of a cheese shop in Naples? Was it your little Italian grandpa? For such a simple food, the answers are surprisingly complicated and more than a little controversial. Let us unravel the stringy history of America’s favorite cheesy snack and find out what the deal is with mozzarella sticks. We owe it to ourselves, and to our appetizers. The earliest iteration of the mozzarella stick is traditionally believed to date back to 15th-century France. Sacre bleu! 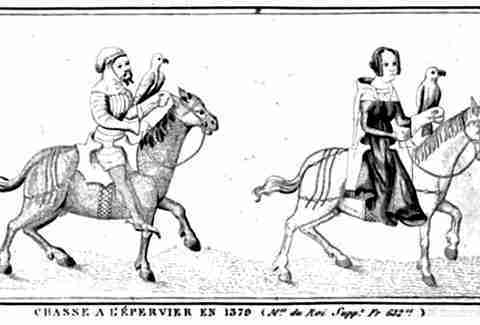 The text in question is called Le Ménagier de Paris (author unknown), a "women's guide" to everything from maintaining a youthful glow to cooking delicious appetizers. Essentially, it's the medieval equivalent of those magazines they sold in the 1950s to bored housewives. The book is written from the fictional voice of an elderly man telling his younger wife what she can do to make him happy. Yep. "Take egg yolks and flour and salt, and a little wine, and beat together strongly, and cheese chopped in thin slices, and then roll the slices of cheese in the batter, and then fry in an iron skillet with oil in it. This can also be made using beef marrow." This is generally upheld as the one true starting point of the mozz stick (alas, the beef marrow was lost to time). 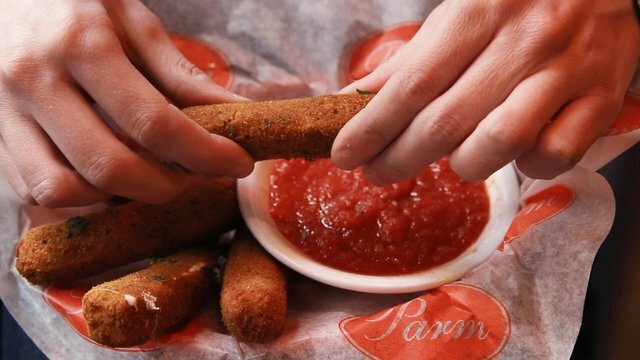 Like King Arthur pulling Excalibur out of that enchanted stone, we were led to believe this medieval book yanked the mozzarella stick construct out of thin air (or a vat of marinara) and brought it into the world. But that probably isn't really the case. Sacre bleu, encore! "If we're really being honest with ourselves, whoever wrote that medieval text would barely see any resemblance between his recipe and what we now know as modern-day mozzarella sticks," said Dr. Joel Jensen, author and food historian. "In fact, modern mozz sticks probably have less in common with the long and storied history of Italians and French frying their cheese and more in common with pizza or French fries." Ladies and gentlemen. We've been led astray. "It's hard for us to imagine this now, but there was a time -- not that long ago, really -- when pizza was considered a cultural food," said Dr. John Gennari, a professor of cultural studies at the University of Vermont who has written extensively about Italian-American food. "The first time the word 'pizza' was used on broad scale was a NY Times article in 1944, and it wasn't really fully popularized until well into the second half of the 20th century. By then, it had really moved on from its Italian influence to become its own American thing," he said. Really, you could make the argument that "Italian-American" could and should be considered its own regional subcategory of Italian food. And mozzarella sticks could certainly be considered a major component of that subcategory. "Mozzarella sticks will always be considered 'Italian' because it uses an Italian cheese, and the word itself -- mozzarella -- will always bring up that Italian connotation. But they're not Italian," Gennari said. Of course. The idea that mozzarella sticks aren't actually Italian might come off a little strong. But anyone with even a vague knowledge of Italian food knows that our versions of so many classics that came about after the Italian immigration boom of the early 1900s (pizza, spaghetti, chicken Parm) don't really mirror their Italian inspirations. For example, Italian pizza is simpler, with an emphasis on hand-pulled dough, fresh mozzarella, and a light tomato purée for the sauce, while Americans use a heavier hand with ingredients, piling on toppings, different kinds of cheeses, and a long-simmered tomato sauce. Unlike pizza, the mozz stick is less of an evolution of a European dish. Its origins aren't in any Italian cheese sticks. When people started getting into pizza, mozzarella became a common commodity, so sticks became an easy sell. The first evidence of mozzarella sticks Gennari could dig up wasn't until the late 1970s, just after the pizza boom of the 1960s. 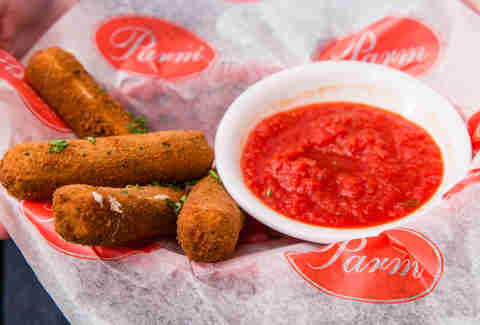 So did pizza joints invent the mozz stick? Probably not. Pizza's popularity paved the marinara-laden road for mozzarella sticks' rise in that it gave Americans a taste for the Italian cheese. But it's much more likely that little Italian pizza shops merely adopted the mozz stick after it became a commodity in bars. After all, how many pizza joints have onion rings and wings on the menu? You can bet your last cannoli that no one cares if they're traditionally "Italian" or not. Ground zero for mozz sticks has everything to do with deep-frying and dives. And those little innocuous sticks even helped kickstart the fried food revolution. "Really, fried foods like French fries, onion rings, and fried chicken probably played into the advent of the mozzarella stick as much as anything else," Jensen said. "Think about fried food: It's not exactly fast food, but it’s fast enough. It’s something that can be uncomplicated to make. It might be impossible to pinpoint the exact moment in time the mozzarella stick rose to deep-fried prominence, but I have to believe someone with a deep fryer was looking for something new besides French fries, chicken, and onion rings that could be made in little kitchens in bowling alleys or bars. They saw the public latch onto mozzarella cheese and took it from there." Jensen, like Gennari, noted that mozzarella sticks really weren't common before the late 1970s and early 1980s -- and both believe they first arrived in bowling alleys and sports bars, primarily. Dr. Amy Bentley, a professor of food studies at NYU, posited that the rise of mozzarella sticks (and other quick, fried foods for that matter) was likely due to an influx of new frying technology in the late '60s and early '70s that made frying foods cheap and efficient. This not only allowed fast-food joints to grow like weeds, it also allowed smaller kitchens -- like those in sports bars, dives, and bowling alleys -- to embrace the glories of deep fryers. And fried food and cold drinks just go together exceedingly well, so it made sense for these establishments to base their menus around them. "Mozzarella sticks, as well as hamburgers and fries, go well with cold beer or soda. 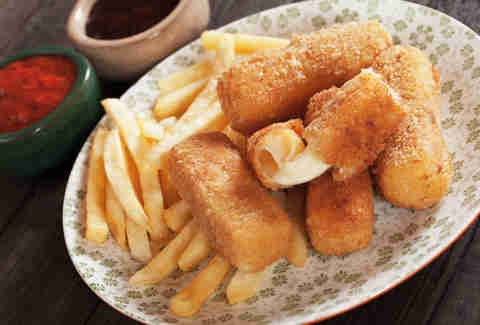 It's a temperature and texture contrast, balancing out and cutting the salt fat of the mozzarella stick," Bentley said. Basically, bars, chains, and other restaurants considered putting mozzarella sticks on the menu a sure thing. "Deep fat-fried items taste good to most people, are pretty durable, and can keep for a while in a warming tray. Melted cheese is pretty lowest-common-denominator food -- that is, will appeal to most everyone," she added. It sounds like perfect bar food because it is. And while it would be nearly impossible to pinpoint the exact birthplace of the mozz stick as we know it today -- no tall tales abound, as with chicken wings -- it's a safe bet that it was birthed in the back of a dimly lit kitchen by a curious/bored chef likely wearing polyester. The success of the mozzarella stick in smaller establishments caught the attention of chains like Applebee's. In fact, mozzarella sticks were one of the first appetizers on Applebee's menu, alongside other staples like French fries and onion rings. And in the New York Public Library's database of historic restaurant menus, the earliest mention of mozz sticks was in 1987, at the Chicken Ranch in New York City. People's positive response to mozz sticks -- a conceptual novelty at first -- paved the way for more experimentation with deep-frying unusual items. "Mozzarella sticks probably jump-started the 'deep-fried revolution,'" Jensen said. "That was the point where people decided, 'hey, we can deep-fry almost anything and people will dig it!' It became the prototype for bar food." If it wasn't for the upstart success of the mozz stick, we might not have things like fried pickles, or -- for better or worse -- any of the state fair fodder we shamelessly love to indulge in. The first real deep-fried experiment worked, and it continues to work to this day. You can see it in everything from the rise of tater tots to the increasing stunt-foods arms race. Would there be a Naked Chicken Chalupa or Cheetos Chicken Fries without mozzarella sticks? Maybe not. Behind French fries, mozz sticks just might be the most popular appetizer in our nation right now. Can you confidently name a more popular starter dish? (No. Not tater tots.) You'll probably find mozzarella sticks in 90% of American towns. Is there a big American chain restaurant that doesn't have the mozz stick plastered on its app list (TGI Fridays even offers an "endless" version of them)? A bowling alley that isn't frying up frozen mozz sticks in the back? Or a brewpub without those succulent cheese sticks in its basic-eats roster? The modern state of the mozzarella stick is bountiful. Even McDonald's has thrown its golden arches into the mozz stick game, to mixed reviews. And online searches for mozz sticks have never been higher. But the widespread popularity might have led to decline in quality. Nowadays, the majority of the mozz sticks you consume are probably pre-made with low-quality cheese and frozen. One anonymous line cook at a New Jersey Applebee's told us, "They come frozen in, like, blocks, and all we have to do is stick them in the deep fryer for a little bit. It's crazy-easy. But, if I had to guess, I would say we get more orders for mozz sticks than any other appetizer. Which I definitely don't mind." Still, despite showing up pre-made at chains from Arby's to Applebee's, there are still restaurants out there making sticks from scratch, just like they did way back when the app was originally conceived. And New York City's Parm might just be among the nation's best. "We make fresh mozzarella every single day," Smith said. "Really, for such simple dish it's very labor intensive and expensive to make. But we consider it to be worth it." They start with the fresh mozz, soaking the curds in boiling water and salt. They hand-pull the cheese, and then shape it into massive rectangles of cheese. The "little logs of deliciousness," as Smith calls them, are then breaded and deep-fried to order, so that they're never greasy or cold. Lightly breaded, they have a light, crisp crunch and are filled with that superlative, stretchy mozz that has probably launched a thousand Instagrams. We may be hitting peak mozzarella stick. Everybody wins. "It's pretty much the high/low point of American cuisine," Jensen said. "It's indulgent, but with all the excessive fried food and Frankenfoods we see nowadays, it's not novel anymore. But people are still eating them." It's true. Where pretty much every other food has been dusted with Cheetos or somehow laden with bacon, the mozzarella stick has stayed remarkably consistent… and in a way, boring. Perhaps this consistency is key to its continuing appeal. For Parm, the simplicity of the mozz stick, which relies on the quality of the ingredients, will always be at the center of the appeal. And they definitely will not be tinkering with what they have again. "We learned our lesson when we tried changing our formula," Smith said. "I think we found perfection in the mozzarella stick, so we don't really have any right to change it. You don't want to fix something that's not broken. I mean, what could you do? It's already like crack, right? I'm not sure people will ever not want to eat mozzarella sticks. That's part of its beauty." We live in uncertain times. While our social media feeds are filled with endless turmoil, and our streets are routinely filled with protesters trying to make sense of the world -- mozzarella sticks remain a constant. A (possibly crack?) rock of regularity. A sweet, breaded, gooey, delicious, consistent crack rock. And it should be appreciated for what it is, where it came from, and all that it's done for us. Here's to the mozzarella stick, the app we need, and the snack we deserve. Wil Fulton is a staff writer for Thrillist. He ate, like, 1,000 mozzarella sticks during the making of this article. Nah, it was actually more like 20, but you get it. Follow him @wilfulton.